February 12, 2010. Dolphin Field Investigator Sturgis Haskins, local historian at Sorrento Harbor, Maine when telling us about Quartet (now Fred Croft's Flipper), also told us that in the late 60's or early 70's there were 2 Dolphins in Sorrento. This other Dolphin was named Telltale and had a light blue cabin. We are trying to get more info about this boat but we have this picture that Sturgis took from the porch of his mom's house on the harbor. Sturgis has pictures in his files showing Telltale and Quartet in the harbor. Click here to see them. Webmaster Note:September 27, 2014. The announcement that George O'Day was being inducted into the National Sailing Hall of Fame caused a review of files involving those who knew George O'Day. This lead to a closer examination of Norris Hoyt's boat Telltale. 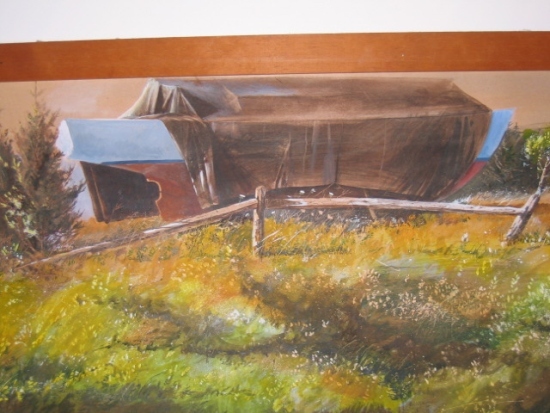 The above picture shows a boat that does not have a wood coaming, and seems to have an outboard in a transom well. The coaming detail would mark this boat as one built probably in the period 1961-1963. June 25, 2010 - Finally catching up on a loose end your webmaster contacted Francis Ballard, one of the 4 owners of Quartet to ask him if he remembered anything about this other Dolphin in Sorrento Harbor. Frances told a fascinating story. He said that that boat was bought as a kit by a man named Norris Hoyt (picture at left) , a well known transatlantic sailor, and writer who was also a long time teacher and coach at St Georges School in Newport, Rhode Island. Norris Hoyt? - where did I see that name???? Bingo! We have a link! The George O'Day page in the History Section quotes a webpage from the old Jim Huxford/Dolphin 24 website titled The Very First Dolphins. It describes a meeting between George O'Day, a well known model maker named Bob Baker, and Norris Hoyt. The first knowledge of this to us came from the web archives of Jim Huxford's old Dolphin 24 website back 3+ years ago. The excerpt was attributed to "Addicted to Sail" by Norris D. Hoyt, and also had information that Norris and Kitty Hoyt had a Dolphin which they enjoyed for many years. Your webmaster recently obtained a copy of Addicted to Sail and found that the excerpt from the Huxford webpage was only part of the story. So, we had to find out more about Norris Hoyt and his connection to our Dolphin 24, and finding some more, decided to dedicate a page in our History Section to him. On that page we have the full reprint of the pages from Addicted to Sail dealing with this model, plus other pages referring to the Dolphin 24. Click here to go to that page. August 5, 2010 Postscript. 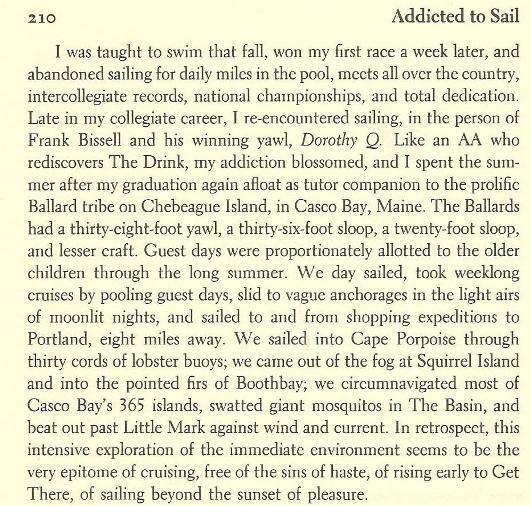 A couple of nights ago, just before lights out aboard Marionette in Sterling Harbor/Greenport, NY your webmaster was reading Addicted to Sail, (by the way, a wonderful read) and specifically looking for Dolphin tidbits, I came across a one liner on page 162. Norris, in a discussion with the "Perfectionist" Erik Skarstrom about Erik's acknowledged boat building/restoration skills, mentions his experience in this area "I had built a Dolphin from a raw hull and deck". It seems that Norris was completing Telltale in the backyard of his home in Newport, Rhode Island. He was unable to completely finish his kit Dolphin, in part because he was having allergic creations to glass/resin, so his friend Francis arranged to have it finished for him at a local boatyard up in Maine, and also have use of the boat for the 3 years that Norris was off racing across the Atlantic, or something like that. How it got to Maine is a story we are working on. Frances remembers Norris paying $1500 for the work. The boat eventually was sailed back to Newport - how it got back to Newport is in part covered in Addicted to Sail referenced above. Best guess when it went back to Newport is in the summer of 1972 or '73. 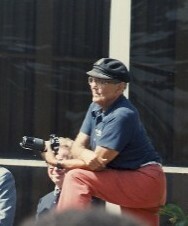 Among other writings Norris was the author of the book The Twelve Meter Challenges for the America's Cup, and also a noted photographer published in several sailing magazines. There is certainly more to this story - not the least - where is Telltale now? Stay tuned. July 13, 2010 Information is coming in bits and pieces - but its coming, thanks to Norris' son William Hoyt, his sister Minnie, and Francis Ballard. Frances and his family had a long relationship with Norris dating back to the 1930's when Norris was a kind of tutor for the kids in the family. August14, 2010. Postscript. On page 210 of Addicted to Sail, Norrie tells us more about his tutoring. Back on track, according to Minnie the kit that was to become Telltale came, possibly in 1964?, in two major separate pieces - a hull and a deck/cabin structure, and a bunch of other parts that filled the Hoyt's basement. Minnie recalls, that because her dad was allergic, she ended up inside the boat holding nuts while her Dad glued and tightened bolts on deck. (It took a while, years? to get the boat in the water. 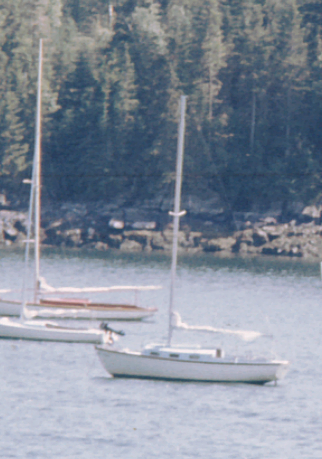 It appears the boat got to Maine, somehow, in 1967/1968 - we are working on this. And we are working pictures from both families' archives, including a very special one. July 23, 2010. We found that special one. 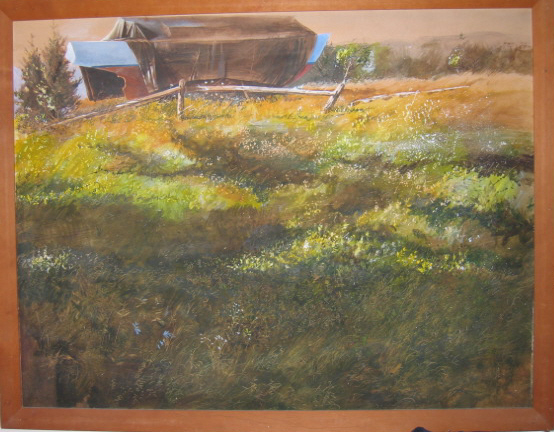 William B. Hoyt is an artist (here is his website http://www.wmbhoyt.com/). Back in the early 1960's when his dad and Minnie were working on finishing Telltale, he painted Telltale under her cover in the backyard. Minnie has found the painting - it is on wood and is 36" x 47", unsigned and undated. Below is a close up of Telltale in the painting. August 21, 2010. Al See, Elation, a Shaw 24 in Dallas, Texas, adds some info and perspective on Norrie(y) and Telltale. Saw the bit on Norry Hoyt and the Dolphin 24 "Teltale"on the site. Small world. I am a member of the class of 1968 at St. Georges. Norry was my advisor, springboard diving coach and taught me Black & White photography form load bulk film into cassettes, to developing the negatives, to enlarging the negatives, to serving as a photographer for the yearbook for which he was the advisor. I distinctly remember 'a boat' under a tarp on the north side of his apartment attached to Dimon North dorm. I also remember mention, at one or more of the many yearbook sessions at his house, of Norry being allergic to fiberglass. The boat was there when I arrived in the fall of 1964. I regularly walked past it on my way from my room in "20 house" to classes in the "New Schoolhouse". I'm fairly certain, it was gone by my graduation in June 1968. In 1978 I was back for a Reunion and had a sail with Norry on a 40 footer he was sailing all around also named "Teltale". I remember, returning to the mooring after the sail, that he was recently arrived in the harbor and uncertain of exactly which mooring off Ida Lewis was his. So he dropped the jib, sheeted the main in hard and cruised the boat as if she was under power. That was Norry - don't bother with the engine when you can do it under sail. If you run into Wimby or Minnie Hoyt again please tell them I say hello.